Every member of USA Gymnastics’ board of directors has resigned in the wake of testimony from more than 250 women who said they were abused as young athletes by former doctor Larry Nassar. Three USA Gymnastics board members resigned last week, after a judge sentenced Nassar to 40 to 175 years in prison for sexually assaulting young women under his care. Today, the organization announced the entire board had resigned, and it would begin forming an interim board next month. In all, more than 265 women and girls have reported abuse by Nassar. The 20-member board had come under fire following revelations that Nassar, the former doctor for USA Gymnastics and a sports doctor at Michigan State University, had sexually assaulted some of the nation’s top gymnasts, along with other athletes at the university and local gyms. Nassar’s sentencing last week came after he pleaded guilty in November to seven counts of sexual criminal misconduct that took place in Ingham County, Michigan. He faces three additional charges in neighboring Eaton County this week. In all, more than 265 women and girls have reported abuse by Nassar, a Michigan judge said during that sentencing hearing today. USA Gymnastics President Steve Penny stepped down months ago. But in a letter addressed to USA Gymnastics last week, the U.S. Olympic Committee called for bigger changes and asked for the resignation of every single member. USOC did not immediately respond to the PBS NewsHour’s requests for comment about today’s resignations. USA Gymnastics also said it will continue to embrace recommendations from a June 2017 independent review of the organization’s policies related to the handling of sexual misconduct cases. The fallout from Nassar’s sexual abuse extends beyond USA Gymnastics. Last week, the president and athletic director of Michigan State University announced they wound resign. On Monday, the state’s attorney general asked the university to handover all documents, texts and emails about Nassar as it investigates how MSU officials responded to sexual assault complaints lodged against the former doctor. The next day, Texas Gov. Greg Abbott asked the Texas Rangers to investigate allegations of assault at Karolyi Ranch, the former national gymnastics training center where Nassar treated some of the athletes. USA Gymnastics announced last week it was cutting ties with the ranch. 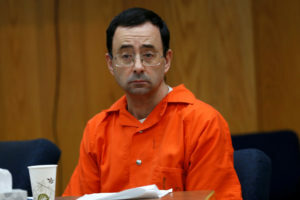 Left: Larry Nassar, a former team USA Gymnastics doctor who pleaded guilty in November 2017 to sexual assault, listens to victims impact statements during his sentencing in the Eaton County Circuit Court in Charlotte, Michigan. Photo by REUTERS/Rebecca Cook.